With over 600 signed up, this year’s U.S. Go Congress in Boston has the most registrants in the 32-year history of the event and it seemed as though just about every one of them was crowded into the main playing area in Boston University’s George Sherman Union Saturday night as AlphaGo’s Aja Huang 7d gave the keynote address, along with Fan Hui 2P. 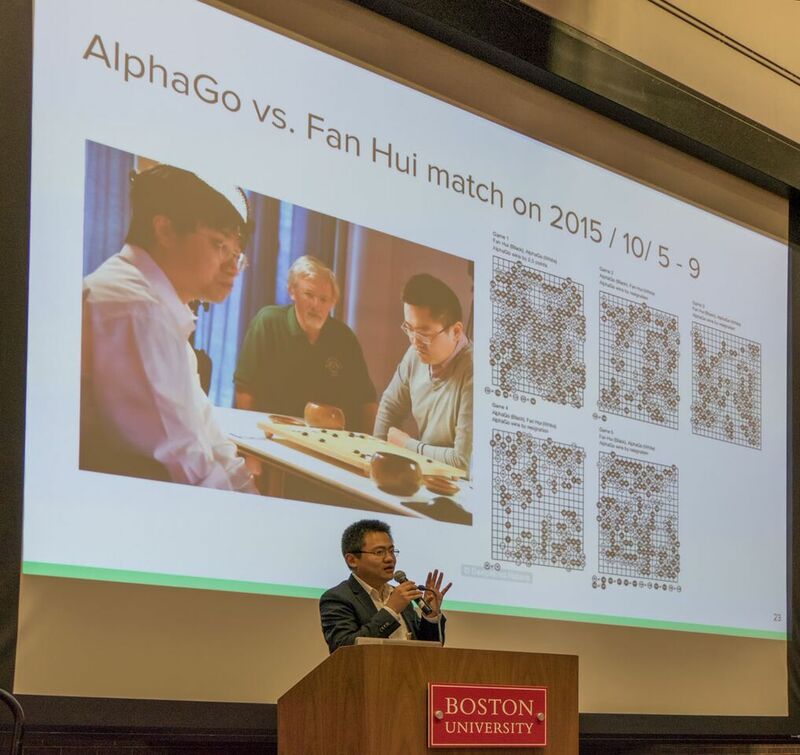 The audience was spellbound as the two gave a fascinating insider’s look at the two-year development of the AI program that decisively defeated Lee Sedol last March and attracted global attention to the game of go. 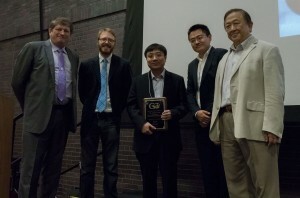 Huang (right) gave an overview of how AlphaGo started in 2014 as a 2-man project as he and David Silver worked to explore deep learning and reinforcement learning with computer go. 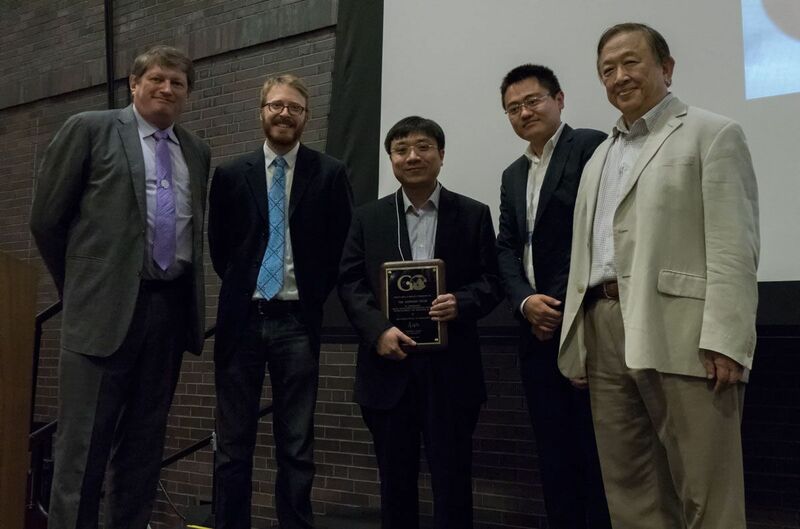 (Click here to see the video of the keynote speech) The policy network trained by supervised learning was developed by Chris Maddison and the team realized significant improvement in the latter half of 2014 by combining the policy network into AlphaGo. While the details are fully explained in the team’s Nature paper, Huang shared personal stories like how Fan Hui was chosen to test the program. “I saw him at a tournament in Dublin and the top Korean players were all going out to drink the night before the tournament but he said no, he couldn’t go because he had to prepare for the games, so I knew he was very serious,” Huang laughed. Fan Hui (left) said that he almost missed the invitation to visit the DeepMind team in London because it seemed a bit odd and he thought “it might just be spam.” In fact, “when I heard it was Google, I assumed they would be hooking me up with something like Google Glass, so when I found out they just wanted me to play a computer program I was so relieved and thought Oh, this will be easy.” In perhaps the most poignant story of the evening, Fan Hui took the rapt audience through his five secret games with AlphaGo in Fall 2015, losing every game until at the end, “my game was crushed and I thought I now knew nothing about go.” Out of those defeats, however, Fan Hui discovered even greater depths, not just to go itself, but to his own fascination and love of the game. “What AlphaGo teaches us is that you can play anywhere,” he said, as the audience erupted in applause. After their presentation, the two took questions from the audience, many of whom wanted to know things like when an AlphaGoBot on KGS will be available and whether a strong version of the program would be available in the near future for desktops or handhelds. Most were answered cryptically with “Under discussion,” but in response to a question about how strong AlphaGo is today, Huang — who had earlier showed a graph charting improvement of one rank a month — did say that it was possible that the program could now give a professional two stones, but that this has not yet been tested. 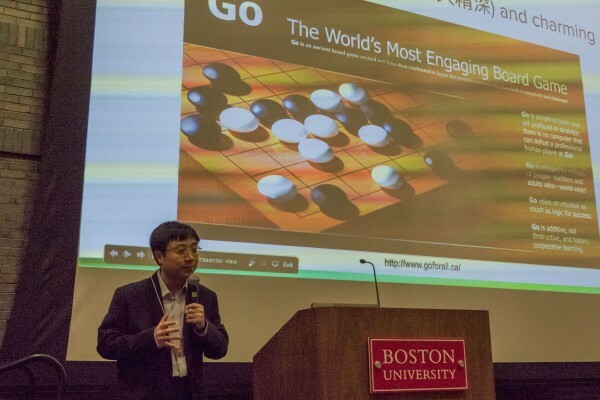 He also said that commentaries will be released soon on all five AlphaGo-Lee Sedol games, as well as three games between AlphaGo v18 (the version that played Lee Sedol). Click here to see the complete video of the keynote speech. Read more about AlphaGo here and check out all our AI posts here.